The world's religions have emerged as one of the greatest geopolitical forces now shaping our lives. Now available in an updated edition, this authoritative atlas is an essential resource for understanding the powerful role of religion around the globe. In an accessible text packed with information, it maps the current nature, extent, and influence of each of the major religions and shows, country by country, how religions are spread through broadcasting, missionary work, schooling, and banking; how they relate to government, laws, and world hunger; and the role they play in wars. It traces the emergence of new religious movements, the survival of traditional beliefs, and the presence of atheism and agnosticism. 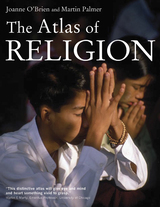 The Atlas of Religion also locates the origin, the heartland, and the sacred places of each of the major religions and provides essential background with a valuable table showing the fundamental beliefs of Buddhism, Christianity, Hinduism, Islam, Judaism, Sikhism, and Taoism. Joanne O'Brien and Martin Palmer are members of the International Consultancy on Religion, Education and Culture (ICOREC), a UK-based group that specializes in working with religions worldwide. Martin is a regular TV and radio broadcaster for the BBC, and heads the Alliance of Religions and Conservation (ARC), which develops environmental projects with religions worldwide. Joanne has headed work with Buddhists in Asia and the Benedictine Order of the Catholic Church for ARC. She also runs Circa Religion Photo Library, one of the largest such libraries devoted to religious topics. They are both authors of many books on religion, including Religions of the World and Festivals of the World.